In September, The New York Times published "I Am Part of the Resistance Inside the Trump Administration", an incendiary op-ed by an anonymous senior official. Since then, there has been wild speculation and sleuthing about the identify of the author. 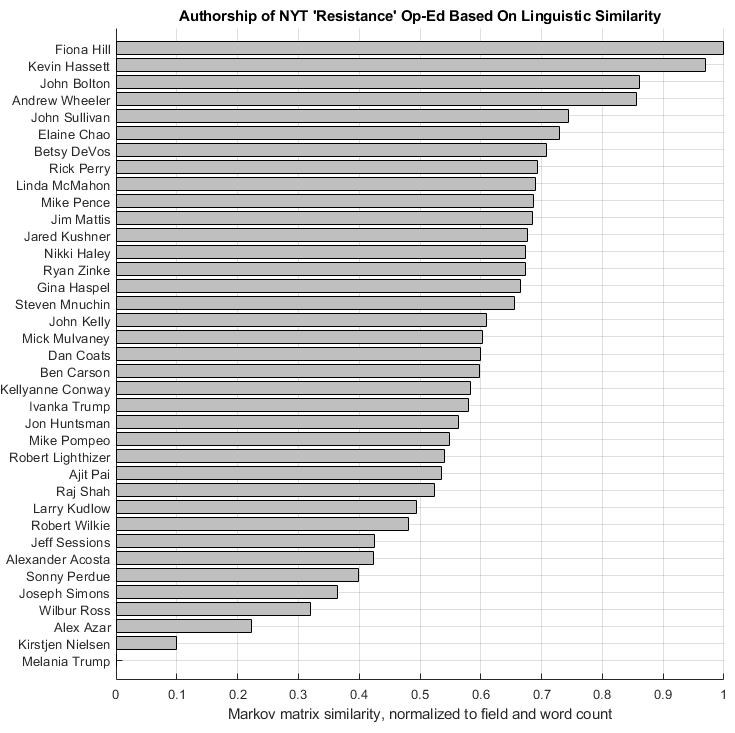 In this post, I aim to cut through the noise and identify the most likely author using natural language processing and other contextual clues. First I assembled a list of candidates from Wikipedia, PredictIt, and a few other informal forums. It covers all the top contenders, though isn't exhaustive due to the sprawl of the executive bureaucracy. "Since 1998 when this terrorist payments program reportedly first began, the United States has contributed more than $4.6 billion (in constant dollars) to the PA. The great majority of this amount has been in straight budgetary support to the PA, enabling it to meet its budgetary commitments." After parsing all the text, I extracted a dictionary of all unique words across all text, including the anonymous op-ed. Then, I generated Markov matrices to track word transition probabilities, i.e. Mrkv(word_x, word_y) gives the probability that word_y will follow word_x in a sentence fragment. I also extracted at the overall distribution of words, i.e. 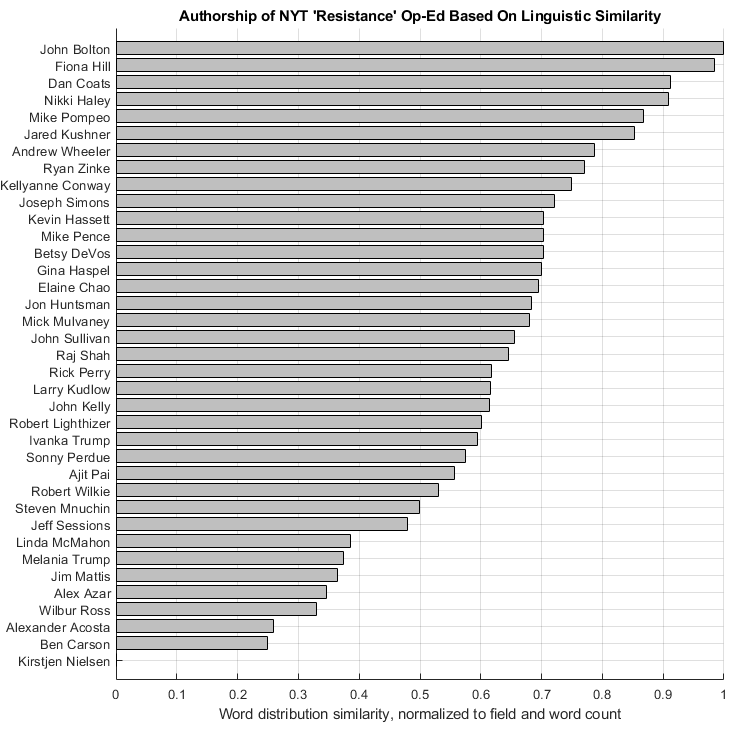 Dist(word_x) gives the frequency of word_x in the author's overall writing. Both Mrkv and Dist are created using "hit counts" and then normalized to the word count, and so their values represent probabilities. 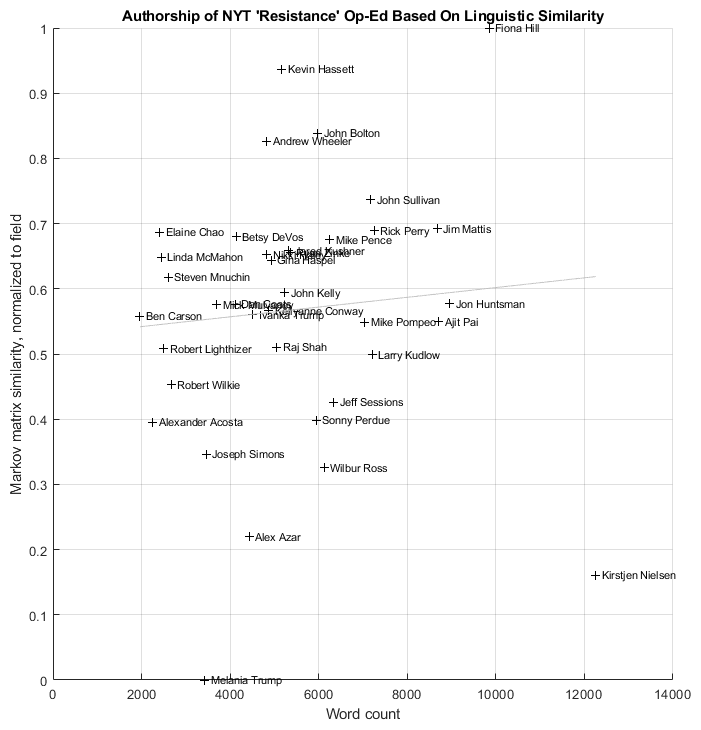 Notably, Hill scores highest in both similarity metrics. However, before jumping to conclusions, note that although Mrkv and Dist are normalized to word counts, there is an additional correlation between word count and similarity. A typical op-ed is ~1,000 words, so theoretically could yield 1,000 word combinations (neglecting grammar). Compare this to the 10,000-word dictionary, which yields 100,000,000 combinations. Our language is too rich to "exhaust" a person's speech in even 10,000 words because unique combinations are so plentiful. 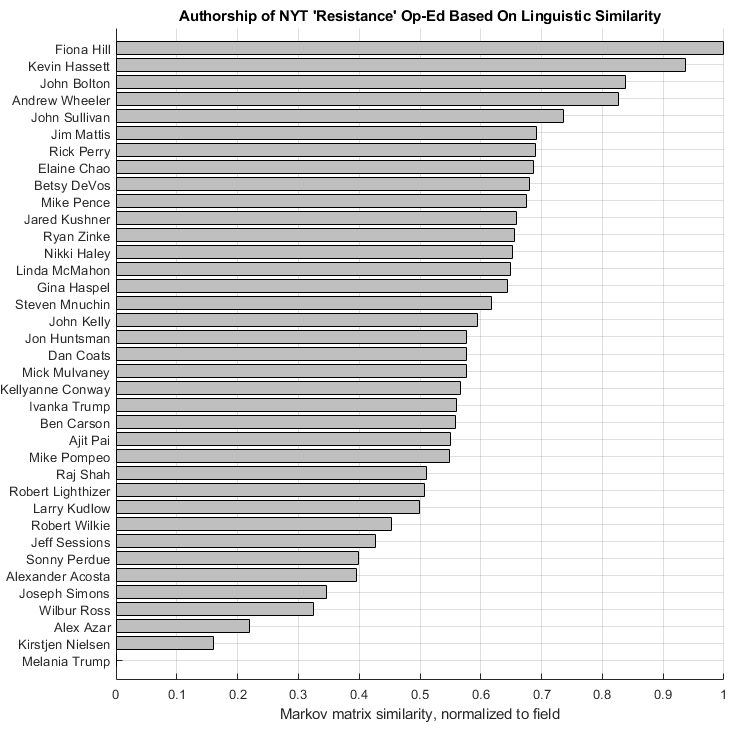 In this case, the more text provided for a candidate, the higher they score in similarity, because they have more opportunity to stumble upon a rare combination matching the op-ed. So an additional normalization is necessary. To account for this, I re-scored the Markov and distribution similarities as the vertical distance off the linear fit line, and re-evaluated. The intent was to make results maximally dependent on style, not length. 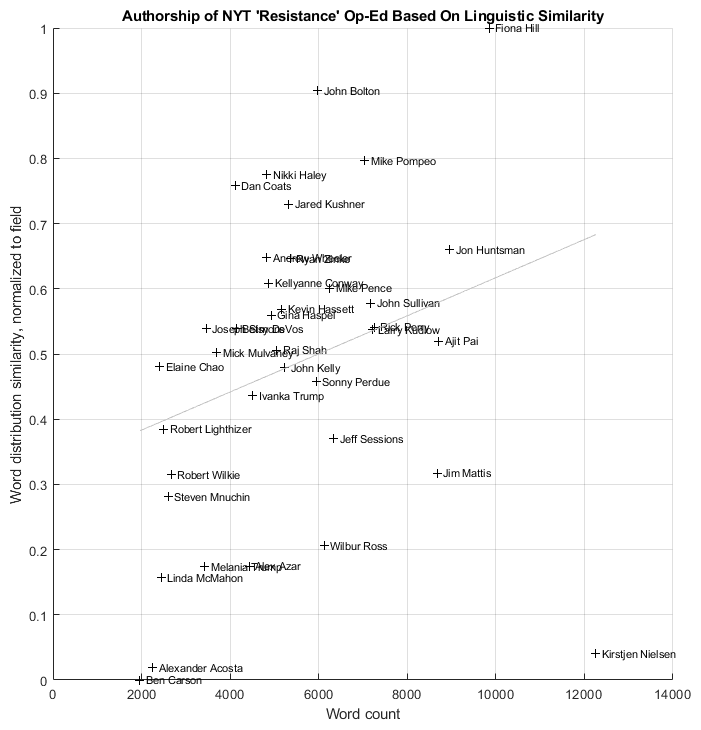 Only two candidates rank in the top tier for both similarity metrics: Fiona Hill (#1, #2) and John Bolton (#3, #1). Hill's case is stronger from the linguistic perspective, and the gap widens further upon considering the additional circumstantial evidence. Hill is one of only six people on this shortlist to have not denied writing the op-ed. (The others are Ivanka, Kushner, Sullivan, Kelly, and Miller. 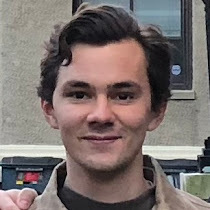 Of this set, Ivanka, Kushner, and Kelly appear to be exonerated by the similarity metrics; John Sullivan is toward the upper end of the similarity spectrum, but not suspiciously so; Miller could not be analyzed as he is unpublished.) Hill's background is in academia and policy, and her most-recent publications, shown below, revolve around Russia and Putin, both of which are notably mentioned multiple times in the op-ed that is otherwise light on specifics. Bolton has denied authorship, which decreases his likelihood though doesn't rule him out. He has a long history of military and government involvement and is known for being outspoken in his controversial views, making him further less likely to carry out this secretive act. So, between the linguistic similarities, lack of denial, connection to the subject matter, and personality cues, all signs point to Hill. What about the possibility of the op-ed being written in the voice of Hill by a third party for some ulterior purpose? To some extent we can lean on the New York Times' credibility and rule out this possibility; presumably the editors verified the author's identity before publication. It's remotely possible that a verifiable official imitated Hill in writing the op-ed, perhaps to further hide their identity. However, due to the sophistication required for this task, it seems very unlikely. It's not clear what the author hoped to achieve with this op-ed, or how they expected to remain anonymous from a position of national visibility in the age of Twitter and instant, continuous press circulation. Either way, I expect we will eventually know the author's identity, and I expect it will be...Fiona Hill. 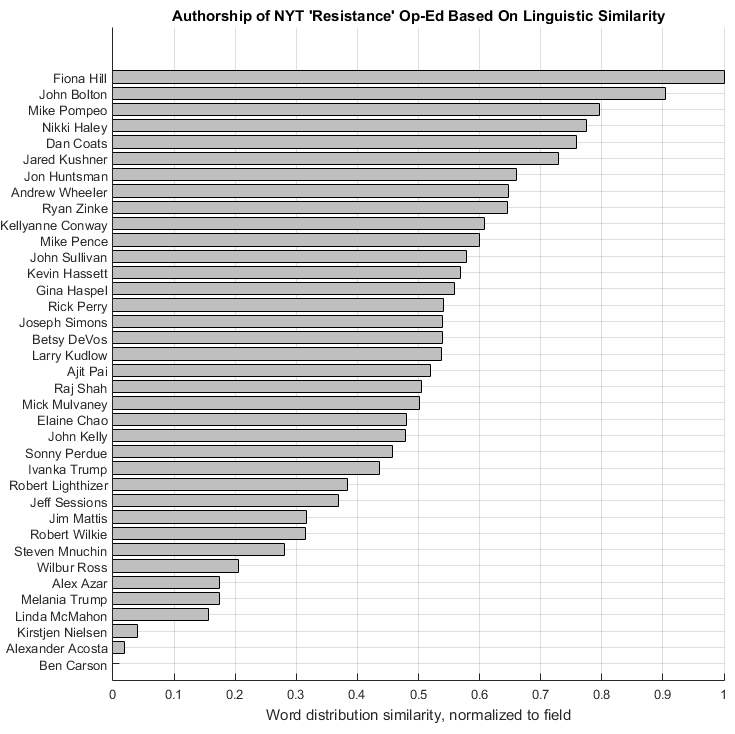 BBC suggests the author is Mike Pence based on "the author's stylistic traits"
Claire Hardaker concludes: "I don’t think forensic linguistics can solve this one"
The Washington Post, conversely, writes: "The outing of the op-ed’s author is virtually inevitable, according to forensic linguists"
Source code and text data are available on my GitHub.